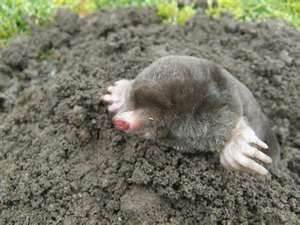 A pretty manicured lawn and yard can be quickly destroyed by moles. These insectivores feed on small subsurface insects that live in topsoil, primarily grubs. Unfortunately the same things that make grass and landscape shrubery grow lush also attract grubs, and ultimately, moles. A typical mole can construct 18 feet of tunnel per day. Due to their extremely fast metabolsim, their need for food is constant and so is their digging. Although actually beneficial for the environment by virtue of their natural pest control of lawn insects and causing aeration by their digging. Their digging causes mushy "runs" just below the lawns surface, and can destroy the aesthetics of any yard. 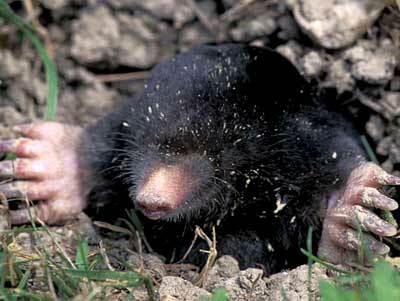 The Eastern Mole is the common one found in NW Louisiana. A gray, brown, or tan short furred animal, 6 to 8 inches long, with a pointy nose, a short stubby tail, extremely small eyes and ears, no tail, and large fleshy , outward pointing forepaws. Mainly active March and April and August thru September, when grub worms are high in the topsoil, but can be active anytime of year if conditions are right. The key to mole control is stopping them when activity is just starting before they get established. Our experienced mole trappers can trap the moles in your yard, and treat your lawn to keep others from moving in and establishing themselves. 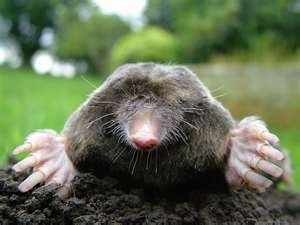 IF YOU NOTICE MOLE ACTIVITY IN YOUR YARD, CALL US RIGHT AWAY, before the moles get "settled in". 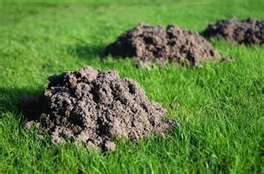 ACE SERVICES PROVIDES TRAPPING, REMOVAL, AND PREVENTATIVE CHEMICAL LAWN TREATMENT SERVICES FOR MOLES IN BENTON, BLANCHARD, BOSSIER CITY, DOYLINE, ELM GROVE, GREENWOOD, HAUGHTON, KIETHVILLE, MINDEN, MOORINGSPORT, SHREVEPORT, STONEWALL, AND THE SURROUNDING TOWNS. mushy runs in the yard? long ridges in the lawn?